Yes, we have door to door service. We will droop you, at the place that you need. In most cases your driver will be waiting in front of your arrival gate near the airport information desk with sign bearing the lead name of your group. It is important to follow the Airport Instructions on your Transport Voucher, which give you full details. YES. All our drivers speak English. Sometimes we are obliged to hire local transport company, in most cases we choice those who speak English. Firstly don’t worry, then call the telephone number as per your booking confirmation, where our experienced staff will be able to help. Please contact us on the number provided on your Transport Voucher or contact our Central Reservation. Give us all the details. We will then deliver them to you. In some circumstances a charge may be applicable. All the airlines have handling agents. They will organize for any luggage to be forwarded to your resort address. 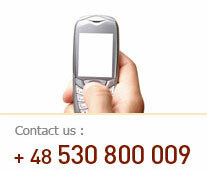 However if you need our help, just contact us. At the time of booking you will receive a Reservation Request, which will then be confirmed by our office. On confirmation of your booking you will receive a Transport Voucher which contains important travel information. If you do not receive your Transport Voucher by email please contact us, as soon as possible. It is comfortable to print the voucher, and keep it with you. Your email Transport Voucher is your receipt. If you need any extra “tax receipt”, contact us before, so the driver will have it. Our booking proces is easy and simply. However if You need to speak by the phone, please call us. You can make your reservation via the phone. Prepare your data, such as dates, flight number etc. All prices are quoted in Polish Zloty. There is a possibility to pay in Euro, or American Dollars. Prices will depends on currency value. However we don’t have any commisions, or surcharges. Our private transfers are always direct. No you don’t need to. We are making privat tours, that means that the whole car is just for you and your group. Your private transfer will normally be at the airport for the scheduled arrival time of your flight. We monitor flight arrival times so as to be waiting for you when you arrive. If your flight is early or subject to delays, we will track your flight`s progress and send your driver at the new expected time of arrival and there are no additional charges if your flight is delay. Please inform us at the time of booking and we will make the necessary arrangements. However extra charges may be applicable sometimes. Mostly the prices in bekrakow.com are better than normal taxi, and you know it before the trip, You don’t need to worry, that someone want to cheat you. All the drivers speak English. Yes we provide a 24 hour service. YES. We are fully licensed, and all our cars are insured, including passenger.